I've spent a little time improving the Pure Data MIDI Step Sequencer patch that was originally posted here. 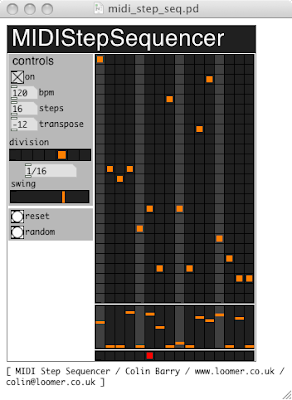 This new version adds selectable step divisions, and a fairly decent swing algorithm. The code has been tidied up somewhat too; in many places, lists provide a much more cohesive data structure than the separate pitch and velocity streams that the first version used. Download the updated patch here.